As our favorite sports season slowly comes to a close, we're getting into playoffs and the famous Super Bowl, where hopefully at least a few of you can cheer on your favorite team—unfortunetly, I will not be one of those people. Regardless of how your team is doing this season though that shouldn't stop you from rocking the sports gear. I love reppin' my teams by wearing everyone's favorite accessory—a baseball cap. 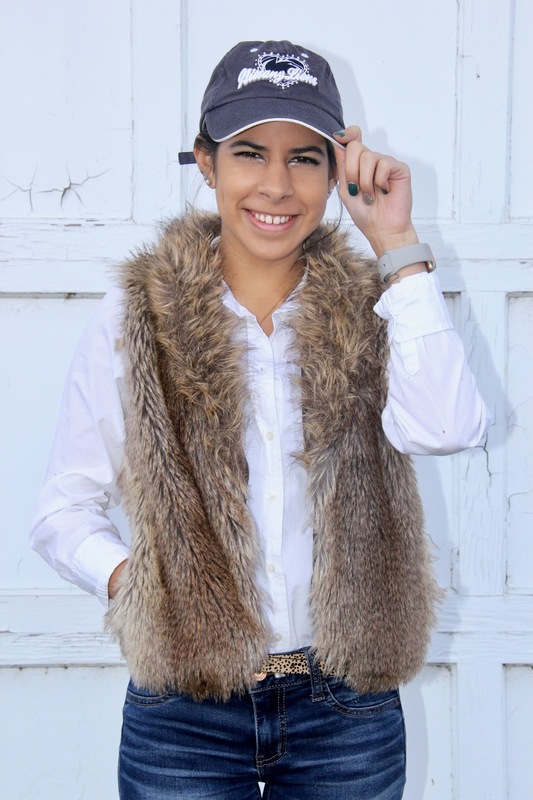 I love baseball caps because I always want to put a stylish twist to my sports gear and this is just the easiest way to do so! For those of you who watch college football and recently saw the Rose Bowl game, my school unfortunately lost. It was, however, an amazing game and just like every other Penn State fan I'll continue to rep my school. 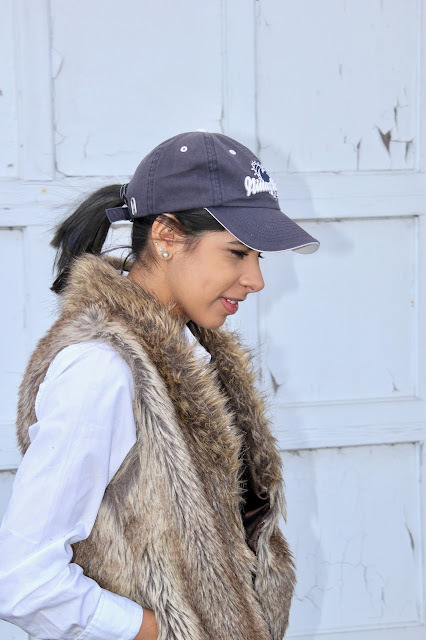 For this look I decided to style my Penn State baseball cap a little on the dressy side and I love the way it turned out. It's a super simple look but works perfect for many occasions. 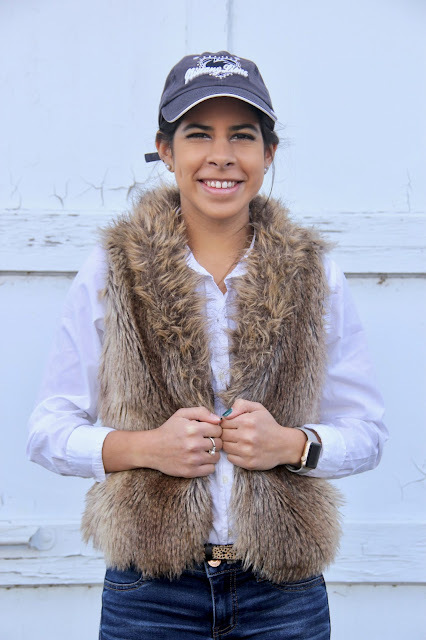 If you're not feeling the dressy look, you can substitute the Oxford shirt for a sweater or long sleeve T-shirt and swap out the faux fur vest for a simple puffer vest. Whatever suits your style the best! 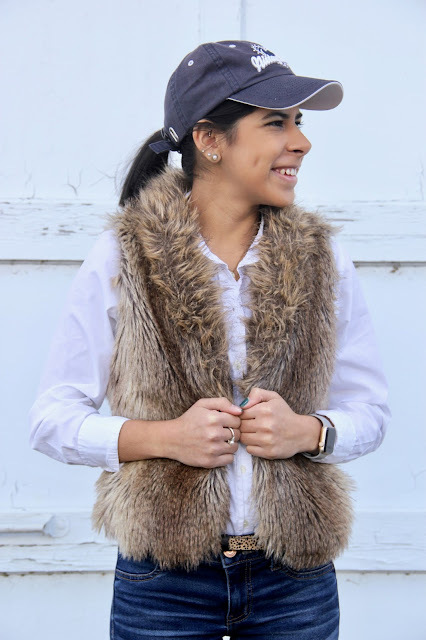 Faux Fur Vest - This vest is a little on the pricey side, but it was the most similar I could find to the one I'm wearing (purchased from Express a few years back.) Try Forever 21 for a cheaper option! Leopard Velvet Loafers - In love with these!